Gangly Sister, featuring Purple and Nine, boost your daughter's confidence! | Would you love to join Gangly Sister? Gangly Sister is looking for a marketing co-founder. We value enthusiasm over experience. Following is everything you need to know. To apply, send an email to rebecca@ganglysister.com telling us why you are The One, and the URL of your LinkedIn and other social media profiles. If you don’t have social media profiles, you aren’t the right person for this position. Gangly Sister is looking for a co-founder who can turbo boost the company’s marketing and online exposure. We are transforming how girls are portrayed in the media. Our product is finished and on sale now. The co-founder is an equity-based, part-time position. You don’t need experience, just great enthusiasm and the ability to learn quickly. You need to love working with people, be amazing at online outreach, and be decent at in-person networking (and willing to get better at it). You’ll be working with a seasoned executive with more than 25 years in the business. You’ll be developing a lot of industry and media contacts. Gangly Sister is transforming how girls are portrayed in media through digital comics, apps, video, and online worlds. 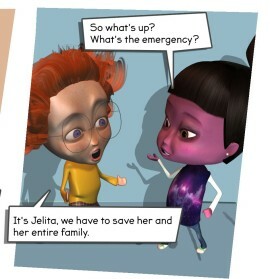 In October 2015, we released a series of 3 digital comics, Purple and Nine, that portray girls solving problems locally and globally through technology. In other words, you’ll be joining as a co-founder to a company that already has a product to sell, and your job will be to help us to create community, get the word out, and market the products. The next steps for us will be creating user groups (fan clubs) and developing apps. You will be doing everything needed to build up an audience and a movement. We’ll be doing a lot of work to support and build the women in tech movement, and we’ll be doing everything we need to do to build a fan following. You’ll be developing and executing whatever campaigns we need to get the word out. What does that mean? It could be anything from building up an Instagram following to going to girls’ summer camps. It could be attending Comic Book Conferences or participating in women’s media conferences. Most importantly, it means working in a partnership with our CEO. We’ll speak at least twice a week for brainstorming, updates, and keeping one another on track. This is a co-founder role, in other words, you’ll be working in return for equity in your spare time. We expect you’ll have a day job, or maybe you are a college or high school student. Because we have a product, if you are successful, we’ll quickly get to the point where we can pay cash. For now, just equity, and our expectations that go along with that. In other words, it’s part-time and flexible, but your commitment needs to be unwavering to the cause. Love meeting people through social media, in person, or by e-mail. You should have great social skills and perfect written English. Reliable for coming through on your promises and commitments. Bold and honest. You need to be able to tell your boss/business partner when they are full of it. Either have experience being a girl or experience working with girls. One of our characters is a minority and we ourselves don’t have the experience of being a minority, so it’s helpful if you have experience either being a minority, growing up with, or working with minorities. Creative and able to come up with disruptive marketing ideas. Notice I don’t say anything about experience? I don’t care about that. I have 25 years of experience in tech and marketing. If you are starting out, it’s perfectly fine. In fact, it might be better if you don’t come with lots of preconceived ideas of how things need to be done properly. Willing to learn. Willing to try and fail. Willing to try, try again until you succeed. You’ll be working closely with the Rebecca, CEO, so you’d want to know something about that. I mean, it’s a partnership more than it’s a job. Entrepreneur with 25 years of tech management and marketing experience. An experienced mentor and coach to both businesses and individuals. I’ve helped hundreds of people with their businesses, relationships, and fulfillment in life. Inspired and inspiring about creating a huge multi-media company. I’ve been working on this for 2 years, with no signs of slowing down. Organized, with expertise on planning and time and process management. Someone who hates working alone. I really need a co-founder to make my work pleasurable. Friendly and well-connected. I’m an expert networker with broad industry connections and the ability to create strong partnerships and business development relationships. Equity: You’ll get a percentage of the company. You’re getting into a company with a real product to sell, but no investors to dilute you. We don’t have them and aren’t seeking them. We’re building this together from the ground up, and your equity is yours. We’ll be working closely with the women in tech, women in media and gender equality movements, so you’ll end up with great professional connections. You’ll be working with a seriously seasoned professional (more than 25 years in management), so you’ll have great professional mentoring, learning tools for management, marketing and entrepreneurship. We’ll be making breakthroughs for ourselves in our effectiveness and career skills. Fun: What could be more fun than making jokes for a living? Leadership: We are truly at the cutting edge of entertainment for girls at a time when the trend is just catching momentum. Money: We don’t have much right now, but we have every intention of creating a multi-million dollar company within 2 years. There are no guarantees, but if you’re the kind of person who makes things happen, this is the place for you. Hi, I am all for what you are trying to do, but why gangly sister? Gangly isn’t a particularly attractive term, I can’t think of anybody who wants to be gangly. And what is up with your characters? They are quite scary looking, definitely not something that would be easily marketable. I’m not trying to be offensive, I just think you should come up with a friendlier looking cast of characters. 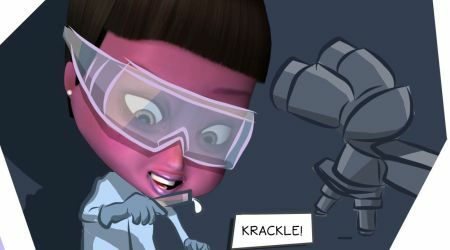 I know this is about empowering young girls, but when they see those characters and think “That’s what women in STEM fields look like. Ew” it really isn’t going to help. I think if anything you should show you can be attractive and in a STEM field, or at least normal looking. Thanks Ben. Not everyone has the same taste. Our testing with children has shown they absolutely love the characters. Everyone is different! You can find dozens of organizations who are working towards this same goal but have conventional, pink-attired and fashion-conscious characters. That isn’t who we are. We do think Purple and Nine are attractive, and so does our audience.